When you're this good, it's hard not to grow a fan base. Something that might not be immediately apparent is that Notoriety is a card that primarily serves to reward early aggression. A typical aggressive runner (like Ken Tenma) is looking to run early and often, maximizing their accesses before servers get really taxing. They can use tools like Account Siphon and Emergency Shutdown to keep the Corp off balance, but ultimately they're under pressure to win before their window closes--they're burning through burst economy resources instead of building them up, so once it's gone it's gone. So as they reach the end of their window, they start getting desperate with their accesses, because if the game comes down to trying to run a server with Caprice, Marcus "End The Run" Batty, and a waiting Nisei counter, they've already lost. Having Notoriety in your deck is an incredible release valve for that pressure. When you know where your 7th point is coming from, you can afford to play a bit more patiently. You rush to 6, and now you can stop and breathe a little bit. Maybe you pick off some assets to get the corp to invest ICE in remotes, maybe you dig for that last Lucky Find, maybe you just count up what you're going to need and click for credits. Because you know exactly what accesses you need, you don't need to play guessing games. You have your goal of "Accumulate X credits, then run three times in a row", and that's all you need to pay attention to. 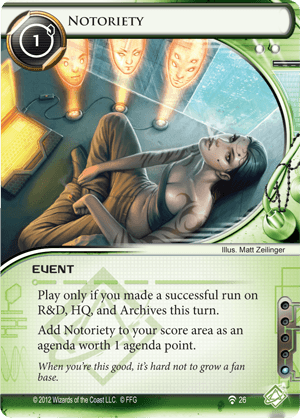 A slower runner deck, such as Sunny, Kate, or Geist can run Notoriety, but they really don't need to--they're already working to hitting a critical mass where the corp simply can't keep them out of their scoring servers. They already have the breathing space that Notoriety provides. This card is a decent consideration now that each faction has tools that specifically help with (Comet, Doppelganger/Early Bird, Eater). However, I would like to try to answer the important question of why, instead of the answer to how. What makes this card good, and why would I consider it in my serious decks right now? There is the obvious secret win, when the corp doesn't expect you to score that last point. Finally, the most important reason. Glacier Corps are becoming a serious issue. Jinteki is running agendas that are incredibly hard to steal. If the Corp has scored 3 Nisei MK II, and you have scored 3 NAPD, and all that is left is the Future Perfect, this turns a very difficult win into a feasible one. As Agenda's are scored and stolen, Agenda density decreases, and this is to the corp's advantage. The most powerful effect of Notoriety is that there are no longer 20 Agenda points in the game, there are 22 or 23. This pressures the corp in a powerful indirect way. As such, I would include this in decks that have central run synergy, and have a difficult time against Glacier Corps. This might be a fine fit for Leela, or Valencia, or Hayley. And let's not underestimate the value of an early point because the Corp let you leak in some central runs early. All-nighter is an excellent partner to this card. You can squeeze in an extra run if one of your central runs fails for reasons you can overcome on a second attempt, and perhaps more impressively you can score two of these in one turn! It's like Runner fast advance. Other stuff like Stim Dealer can do the same job, but All-nighter is in-faction and does exactly what you need it to and no more. If you're going to do this though, you probably want some other way to abuse having five clicks in one turn. A difficult card to score, but may have some windows with Comet and an agressive runner. If you don't you have to spend your whole turn (one click running each server and the last one to achieve this) in this and be good at it since you even have to have the another and another in your pool. Maybe useful also with centrals only criminal or with combination of other events that make you run (Dirty Laundry) or hardware that make your running profitable (Desperado). Also, in Spanish this card is important to note that had an errata and said "succesful run in R&D, HQ OR archives" which was way too good.